Hitachi NEXT 2018, the premier event for the digital revolution, focuses on what’s next for your data – a topic that concerns just about every business today. Most business leaders recognize the need to embrace the digital economy and find ways to better manage, govern, mobilize, and analyze their masses of data to draw meaningful insights and make better decisions. However, relatively few have realized this transformation’s full business value. Digital transformation is challenging and complex, and decision-makers are daunted by the enormity of the undertaking. Many end up implementing small, fragmented projects that result in technologies and apps that work to only a fraction of their potential, are not adequately supported or conflict with other systems. At Hitachi, we’re collaborating to change all that. As demonstrated by our recent work with Toyota highlighted at this year’s Hitachi NEXT event, we’re co-creating with companies to turn their digital ideas and strategies into practical, scalable solutions that not only transform their operational processes, they can also improve the customer experience and create new business models to drive innovation and growth. 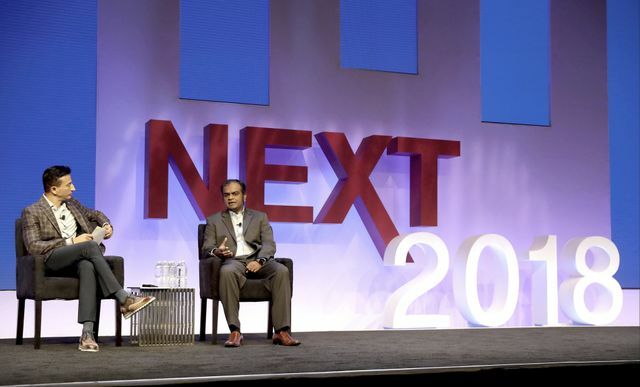 At Hitachi NEXT 2018, Toyota General Manager Jayadev Gopinath described how digital technology is transforming the automobile industry in general and Toyota in particular. When we think about digital transformation in the automotive industry, we usually think about how dramatically innovations like automation and robotics have changed how cars are built. But according to Gopinath, digital technology is also changing the way customers buy cars, the business models automotive companies use to grow their business, the technologies in the cars themselves, and finally the entire competitive landscape as companies evolve from automobile companies to technology companies. Taken together, these real-life examples demonstrate the breadth of the change that faces the industry, from a company that has long been recognized as being on the cutting edge of manufacturing. In talking this morning about Hitachi’s contribution to Toyota’s transformation, Gopinath highlighted three important reasons why the company chose Hitachi as its transformation partner: Hitachi brings the IT and the software knowledge and expertise, Hitachi brings the OT knowledge and expertise, and Hitachi has real-life case studies that prove the depth and breadth of experience that we bring to the table. For example, Toyota recently teamed with Hitachi to build a high-efficiency production model using an IoT model that enables rapid response to diversifying customer needs. The collaboration involves using Hitachi's IoT platform, Lumada, which utilizes digital technologies such as artificial intelligence (AI) and big data analysis to acquire and use data more efficiently. The platform enabled Toyota to improve its manufacturing processes, establish a system that prevents facility failures and improve overall quality. In another collaborative effort, Hitachi and Toyota worked together to build tools with digital, virtual capabilities that offer customers new ways to buy cars, making the entire process very easy and providing Toyota with an alternative sales channel. In the nearly 50 years that Toyota and Hitachi have worked together, the two companies have collaborated on initiatives around the world, leading to more than 500 successes that span strategy, digital, storage, mobile and technology. Going forward, the two companies expect to continue working together on many more initiatives that support Toyota’s goal of becoming a data- and analytics-driven company helping to shape the future of mobility. At Hitachi, we help businesses like Toyota digitally transform by improving their operational processes, helping them serve their customers more effectively and creating new business models. Hitachi has hands-on experience in a variety of industries, including not only automotive but also manufacturing, financial services, retail and consumer products, and urban and transportation. Whatever the sector, we take pride in working collaboratively with you to help you digitally transform in ways that drive both short-term and long-term business value.